Celebrating…Having the opportunity to go to Epcot Center for the first time in 20 years! Are you doing these 3 items every time before you take a photo? These items will greatly reduce camera shake and blurriness on your images. One hand under lens to steady it.NOW YOU ARE READY TO PUSH THE SHUTTER BUTTON…FIRE AWAY! I hope you have some time this weekend, to go out and implement these quick tips with your camera. You won’t believe the difference…yes, even with a point and shoot. Are you enjoying these Tips of the Day? I do, I do, all three of them :), but I don’t think I’d be able to produce a pic like this one. Stunning and so creative! Great Photo and advice 🙂 thanks for linking. I love the deep rich tones in this photo! Thank you for sharing and for linking up with Tones on Tuesday! Lovely Laurie. And thanks for the tips! Yes, I love your tips. I use yoga breathing when I take photos, which is similar to your tip above, and I find it really does help. 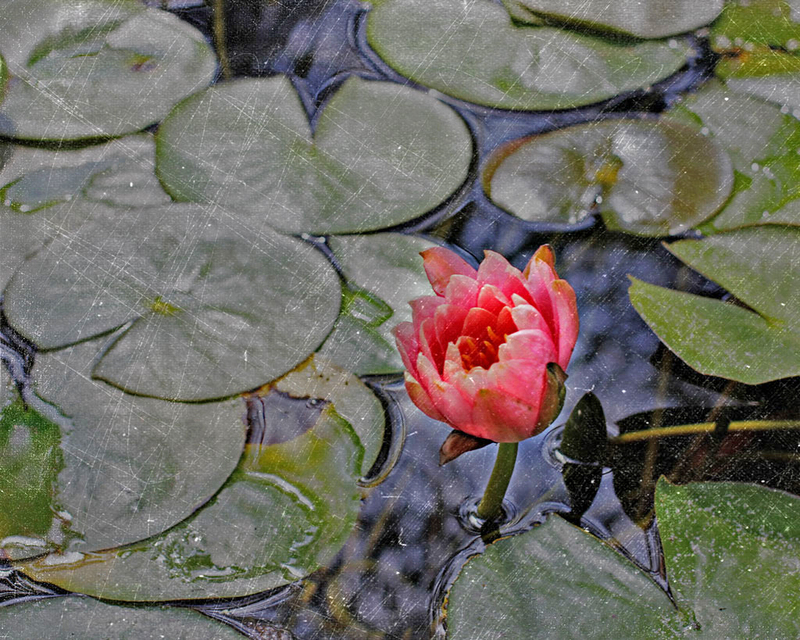 I love water lilies – gorgeous editing! Beautiful picture! Could be a really nice card to write something on it! What a gorgeous photo. I love the linen canvas finish. It makes me want to smell a Water Lily, I don’t think I’ve ever done so. This is really pretty! Monet’s work made me fall in love with water lillies! The love affair continues still today. Your picture is beautiful! Thank you so much!! This is where my love started with them too. I have been wanting a water pond in my backyard filled with these beauties for years…. Congratulations! I have nominated your blog for the WordPress Family Award. Awesome tips, keep ’em coming. Happy weekend! The improvements in technology is amazing…but I will still always do these three things☺ Happy weekend to you to! Another great post and tips too. I do not think I hold my breathe – may account for some of my blurry pics – especially when I am taking them quickly! Beautiful image and equally beautiful words! Thanks! Beautiful image and beautiful words!! “Pride in Photos” has been included in the Sites To See for this week. Be assured that I hope this helps to point many new visitors in your direction. Thank you for reminding! Lovely picture and great postprocessing. Love the image and the beautiful words. Enjoying your tips too. Very easy and simple to implement. Blessings dear Laurie. The texture and the lily go so well together. I am really enjoying your tips of the day Laurie. Thanks! LuAnn, thank you for telling me this. It means alot…to know others are appreciating them…have a great weekend. How is that ELKHART RV treating you?